People keep telling me autumn is underway, and according to the weather experts in Britain’s Met Office it started on September 1st, but they just carve the year into quarters to make their statistics easier to calculate. Clinging to summer, I prefer to stick with the old astronomical calendar and by that measure, the seasons change on the 22nd. That doesn’t stop me wanting autumnal food though. I love the deep, warm flavours and subtle spicing of tagines, which as someone pointed out is just a Moroccan stew cooked under a pointy hat. 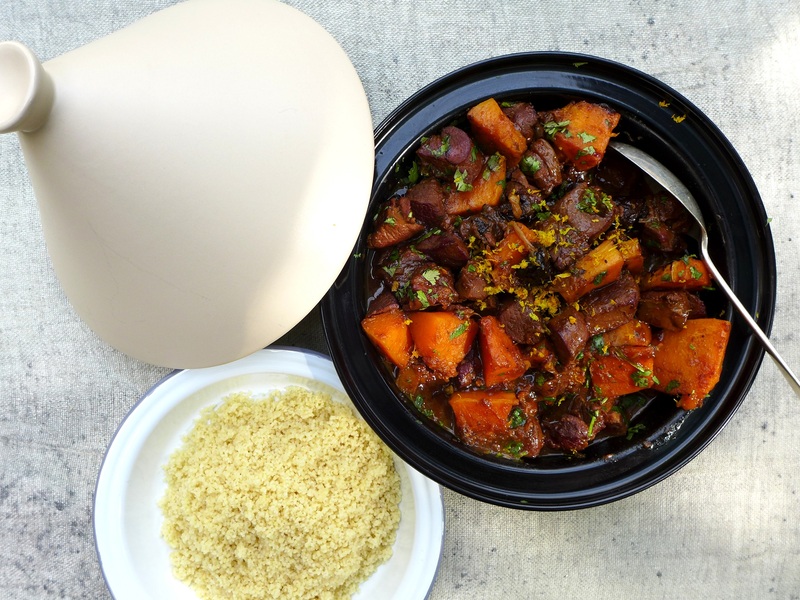 The traditional tagine dish is optional, so don’t worry if you don’t have one, although it does look impressive at the table when you whip off the conical lid for the big reveal. I used venison in this but you could substitute beef. You may need to adjust the cooking time if you’ve got a particularly chewy cut. Pre-heat the oven to 200C/400F/Gas Mark 6, toss the butternut squash chunks in a little oil and roast for about 20 minutes, until just cooked but still firm. Heat 2 tbsp of oil in a casserole and brown the venison in batches. Remove and set aside, then in the same pan brown the shallots, if using. Scoop them out and put them with the meat, then saute the chopped onion until soft and golden, adding a little more oil if necessary. Add the garlic and ground spices and cook gently for a minute or two more. Now add the cinnamon stick, orange juice, orange peel, honey, the saffron and its soaking water. Pour in the stock and stir. Season with salt and pepper to taste. Put the meat and onions back into the pan, bring to the boil, put on a lid and cook gently, stirring from time to time, for about an hour, or until the meat is just tender. Add the squash and prunes, turn the heat up a smidgeon, remove the lid and simmer for another 20 minutes or until sauce has reduced and thickened. Discard the cinnamon stick and orange peel. Carefully stir through the fresh coriander, trying not to break up the squash, check the seasoning, and add a squeeze of lemon juice if it needs sharpening. Serve over a mound of couscous, bulgur wheat or rice, with a little fresh orange zest grated over the top. 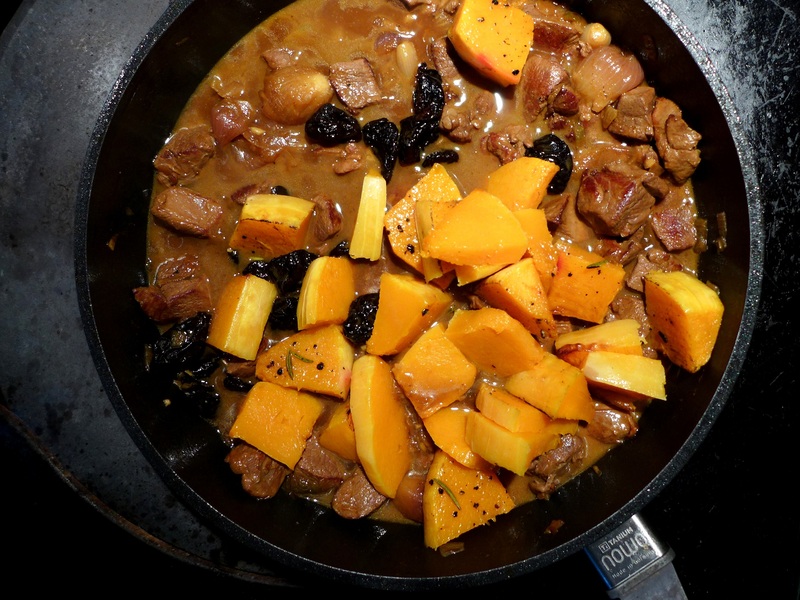 This entry was posted in Game, Mains and tagged muntjac recipes, venison tagine, venison tagine with squash and prunes by Linda Duffin. Bookmark the permalink. That is just beautiful! Today I’m making chili, even though it will still be hot out. Somehow I secretly hope that making autumnal dishes will make fall come sooner? Oh I’m jealous! Not just of the weather but that your husband cooks! 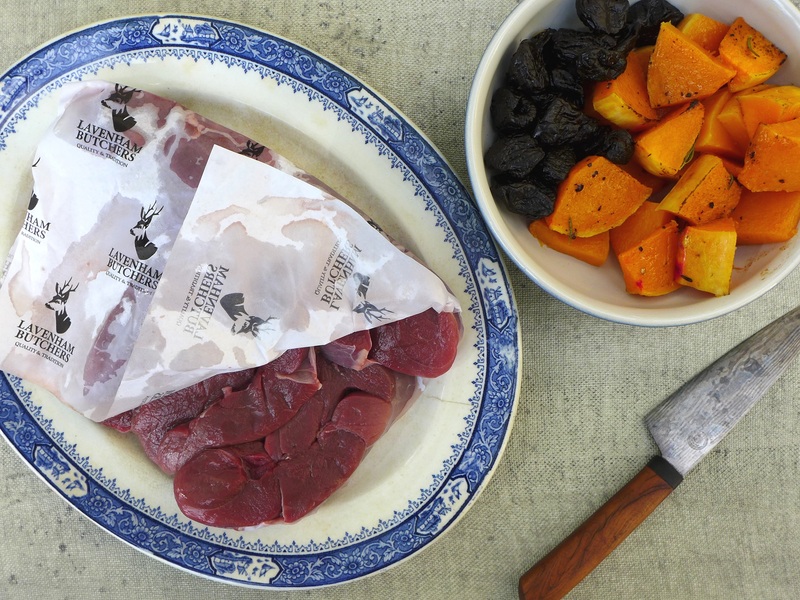 Thanks for sharing Linda, I am a fan of Venison meat and this recipe was New to me, sounds quite lovely With plums and squash. 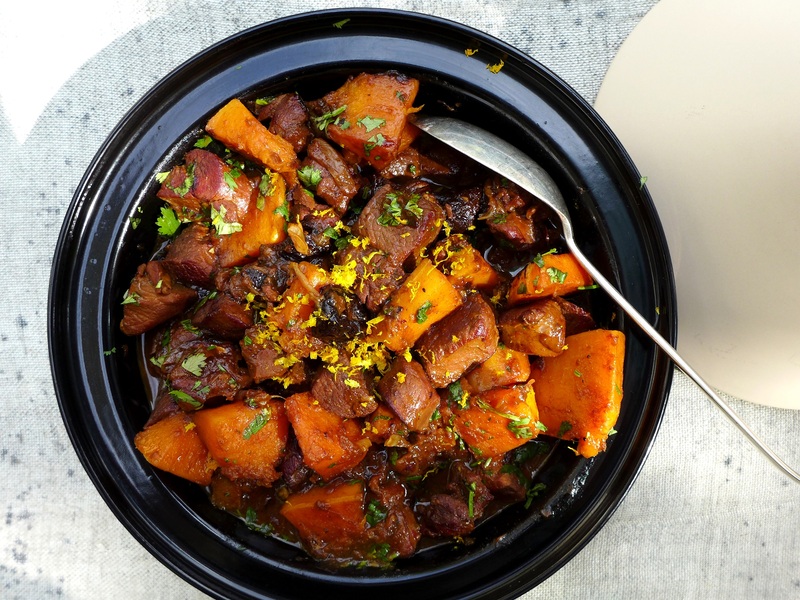 “[J]ust a Moroccan stew cooked under a pointy hat.” That made me laugh. Beautiful stew. If my dad, the great 83-year-old hunter comes back with a deer this year, I know just what to make.